Ron Hudson’s musical career began in the mountains of a small Indian village in northern Guatemala. There he received his early education and was taught by his missionary parents to play several musical instruments. The one he found most intriguing was the guitar. His first guitar was a five-dollar Flamenco guitar with steel strings. Unable to find a teacher, Ron spent many long hours teaching himself. His playing rapidly progressed and he performed regularly with members of the missionary team as well as giving solo concerts and lessons to the students at the mission. At the age of 17 Ron came to the United States where he entered college and continued his musical education. His career as a guitarist/composer now spans several decades with more than twelve albums/cds to his credit. He has concertized extensively in colleges and universities in the United States and across several continents as a solo guitarist of exceptional caliber. His numerous recordings and original compositions include standard classical works as well as a unique array of original works that sprang from his experiences as a world traveler, musician and explorer. Ron is a graduate of Southern Nazarene University with post-graduate studies at University of Texas. While in college he was fortunate to study Flamenco Guitar with Maestro Juan Serrano and was heavily influenced by the unique style of this great artist. Later he was also sponsored by the Government of Guatemala and the Honorable Stella Cheesman to present concerts on a special tour of the United States and Canada. His post-graduate studies also led him to studies in Spain, where the great Maestro Saenz de la Masa, at the School of Arabic Studies, Granada and the world famous composer, Joaquin Rodrigo in Madrid, heavily influenced him. Ron was the first recipient of a music grant given by the Institute of Hispanic Culture to study with these noted masters. 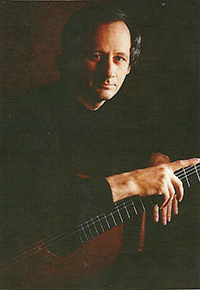 Ron started Memorial Music in 1986 after Musicville, which was also located on Memorial Drive and has built it into a successful music school, retail shop and international guitar business. He also started Maya Records in 1972 where he continues to write and record works of music that have been included in such noted programs as HAWAII FIVE-0, the Outdoor Channel, and Spiderman III. He has also given filmed performances for Public Television and entertained dignitaries across the globe, including the Honorable Don Juan Carlos, King of Spain. Ron has also been the featured guitarist in various plays and theatrical productions, such as Alley Theatre’s production of Camino Real by Tennessee Williams. His life and work as a brilliant guitarist and composer continues to evolve and he is currently writing music to be considered for various movie and television productions. Memorial Music is also a big part of Ron’s service to the community and he has many friends and clients that comprise a wonderful international group of people with shared interests and a love of music and guitar.